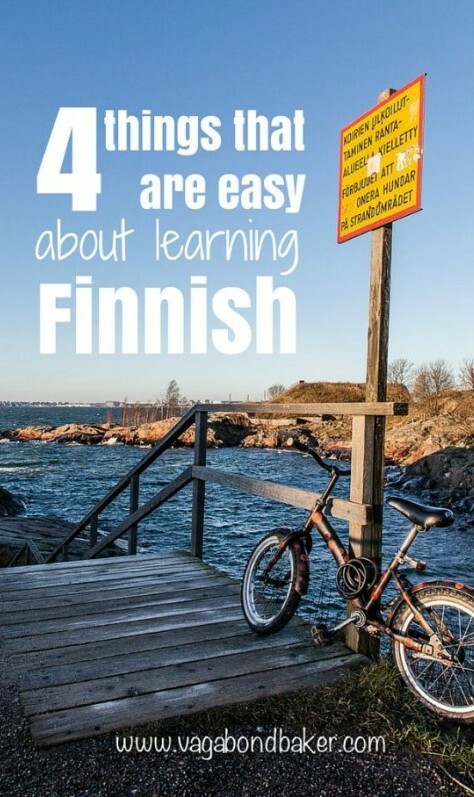 There is plenty of stuff around the internet about how difficult the Finnish language is to learn – hell, it was this fact challenge that got me learning it in the first place! After studying it for nine months now I can see that in many ways the internet is right but also that Finnish is misunderstood: it’s not that it’s particularly hard, it’s more that it is completely different! This post isn’t declaring that I’m finding it easy – far from it – it’s more to highlight the parts of the language that I’m finding painless: every cloud has a silver lining and all that! Learning a language is like learning to bake. To a novice baker making something as complex as French macarons may seem impossible, I’ve been there: it took me quite a few years of baking to reach a point where I felt confident to make them. It was those years of baking though that gave me the knowledge of the techniques to know what I was doing: the how and why recipes work. If vocabulary is the ingredients then grammar is the recipe that brings them all together. Unfortunately for Finnish learners the recipe is more like French Macarons than it is chocolate muffins. It can feel a little overwhelming: it’s overwhelming me all the time! To combat this I try to focus on the positives, the things that are easy about the Finnish language. Yes, there are only four things but they are all fundamentally important things! That means every single letter in a word is pronounced in Finnish, including doubled consonants and vowels (diphthongs). 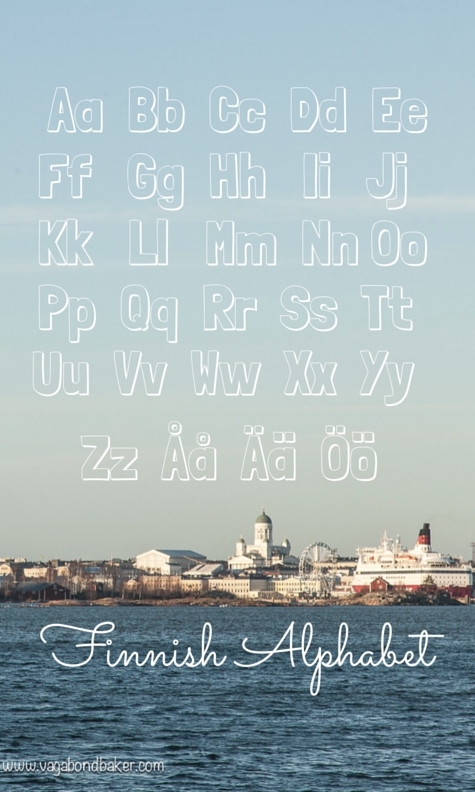 There are 29 letters in the Finnish alphabet yet only 21 of them are used regularly, making the alphabet pretty small (the other letters generally appear in foreign loan words and names). The pronunciation of each letter never changes either, making things even simpler. There are no silent letters and emphasis is always on the first syllable. Some of those diphthongs can be tricky though for native English speakers (i.e. me! ): öy, yö – uh oh more like! And don’t forget to roll your Rs! 2. Those long Words Are Not As Scary As They Look! I used to be terrified of the lengthy Finnish words when I first started learning the language. Now my vocabulary has grown I can see that they are mostly individual words strung together to make one word, often with a little bit of grammar attached to the end. It’s surprising how quickly your brain starts separating out the words and the grammar. They also make sense too with their rather satisfying straightforward translations. 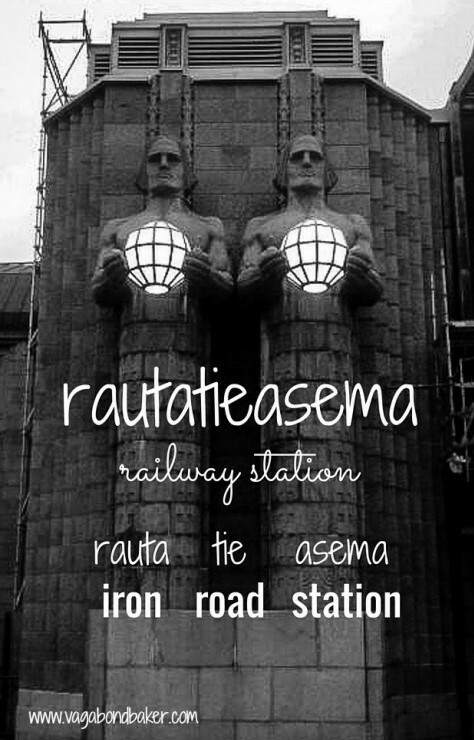 Rautatieasema : railway station >> rauta : iron tie : road asema : station. Astianpesukone : dishwasher >> astian : dish pesu : wash kone : machine. Pöytätietokone : Desktop Computer >> pöytä : table tieto : information kone : machine. 3. Rules Are Rules, And They Are Your Friends! OK, so the grammar is overwhelming but it is logical, in comparison to English – for instance – which is terribly vague and extraordinarily contradictory. Follow a recipe word for word, with the correct ingredients, and – in theory – your bake will be successful. 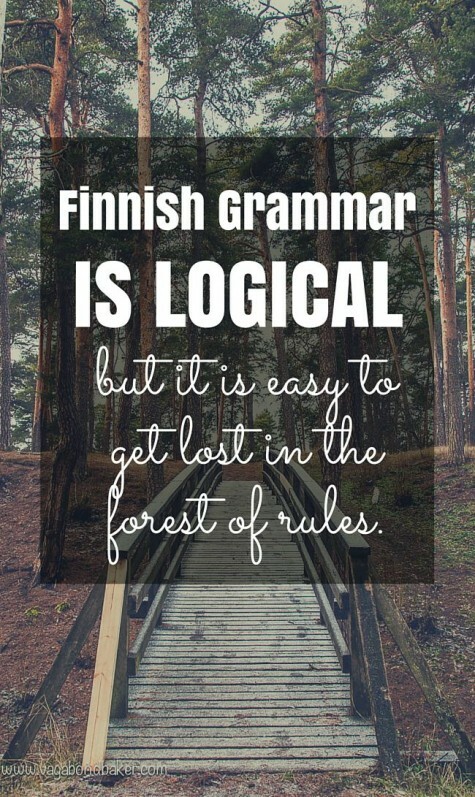 It’s the same for Finnish: apply the rules and the grammar falls into place without exception 99.9% of the time. “i before e, except after c”: believe – conceive. So… neighbour, science, leisure, feisty, ceiling, conceive, ancient – I could go on! This kind of crazy rule-breaking just wouldn’t happen in Finnish! It’s simply a case of learning the rules, and trying not to become overwhelmed by the sheer quantity of them! 4. Finnish Has No Grammatical Gender. There is no grammatical gender in Finnish vocabulary, words are not male or female. There is none of that le/la, el/la malarky you find in the Romance languages. 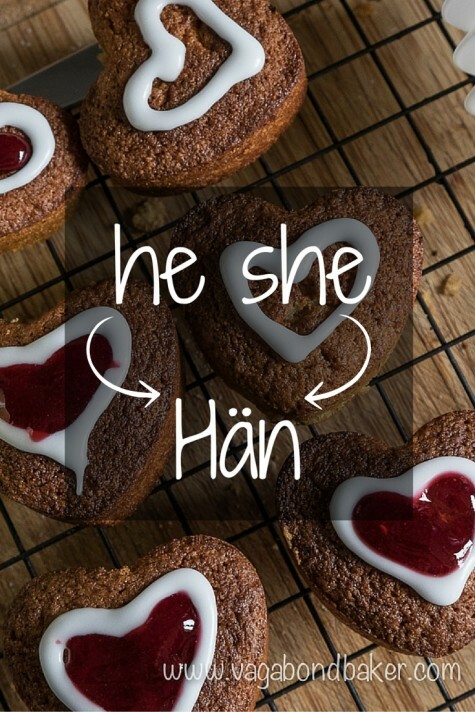 There are also no separate words for he or she in Finnish, it’s simply ‘hän’, regardless of whether you’re speaking about a male or a female. Finnish is a very gender neutral language and it is all the easier for it! How is my Finnish Going? I’m trying hard not to get bogged down with the heavy weight of the grammar, breaking my studies into small chunks. Recently I’ve been building up my vocabulary (the easy bit) and now I really need to start to focus more on the grammar. I don’t feel that I’ve progressed as much as I hoped by the end of the summer – I’m still woefully unable to properly form sentences – and I’m hoping that diving into the grammar will help. I just have to keep remembering those (many) rules are logical and take comfort from the easy stuff! Similar posts you might be interested in, don’t go just yet! How I’m Still Learning Finnish All the links, resources and tips I’m using to study Finnish. What things do you find easy when learning a language? Comment below! Nice writing. I live in Finland for over 5 years now and I’m still not able to speak the language. It’s way to difficult for me, I always seems to fall back to English even when It’s also mot my native language. Thanks Tom! Wow five years! I love learning this language, I wish I was fluent but I still have a VERY VERY long way to go, and I think I’d need at least 5 years to have some grasp! I just caught your post through Finland Explorer. It’s great to see another Brit interested in Finland. I’ve been three times now and spent a Month last Summer sailing the Baltic with som Finn friends. I’m planning a road trip through Europe so that I can have my car in Suomi. I just adore the place. Like you I have lots of Finn words but no grammar. Here’s a sentence for you, it means extremely happy….. Just as I am when there. What a lovely sentence! Thanks Ken! We shall be driving a home-on-wheels to Suomi over midsummer and I can’t wait! It will give me a bit more chance to practice, especially in the north where English might not be so prevalent. Sailing the Baltic sounds great, I’ve only ever crossed it at night sailing from Helsinki to Germany on the ferry! Hi Rachel, I’m intrigued why you sail from Germany. How long does that take, and is it expensive? Being a builder I’m looking to buy a place there this year. May I say Rachel, I’m reading The Kalevala. I bought it on Amazon for around a fiver. It’s Finland’s answer to the Iliad. It gives a real insight into the Finnish national character. Also do you know about The Winter War Finland fought against hopeless odds and beat Russia in 1939. There are four videos about it on YouTube. Sisu is a word made to describe Finns. It means great courage. Of course you must have heard Chisu ( kissu) sing her beautiful songs. I have The Kalevala on my laptop, and I’ve dipped into it to research a character name for a friend. I do know about the Winter War, and a few bits and bobs of history. I have bought quite a few Chisu tracks and a few other Finnish artists, it’s so easy these days to buy foreign music and download them onto phones/computers. Hoorah! Great post.. Some languages are easy to learn. For example I learned Spanish in four and half monthsin Spain when working there. French I learned by reading French books by using dictionary. Portuguese I learned on two winter courses. English I learned in school. So, nowadays my post are in four lnguages. Wow, that’s very impressive! 5 Weeks in Finland and I’m still barely beyond kiitos! Hahaha! I know you’re learning and I remember that feeling. Fellow native English speaker here. But some of your examples are a bit off.. for example “astian” literally is the genitive form. Dish = astia and you need the n to make the proper form for astianpesukone. Same theory for Sateenvarjo Sateen doesn’t diretly translate to rain. Rain translates to Sade so don’t oversimplify it by saying that Sateen= rain. =) Remember the whole grammar thing. But yeah the long words aren’t hard when you remember that they’re usually yhdyssanat, compound words. Good luck with the learning! OK 6 verb types, genetive, partitive…etc. nothing similar that other languages…but OK French macarons, I did it once 🙂 and not again. Yes, I love that this language is so different, that’s what keeps my mind interested! I haven’t tried to bake macarons again for ages! Did you try learn Spanish? I’m a native Spanish spearker (from Argentina) and if you want to talk or learn some stuffs from my native language (or maybe just talk about random things: travelling, geography, history, whatever ) please feel free to contact me. I’m technician in tourism and hotel management, so it’s always a pleasure meet the world and its people. Great blog and I wish to travel as much as you do. Thanks Brenda! I did a year of Spanish at high school so I have an extremely basic knowledge of it. I have tried to pick it up again but I’m so obsessed with learning Finnish that no other language is getting a look in at the moment! I find it fascinating seeing English’s roots in Swedish, I find I can understand quite a bit when reading Swedish magazines and stuff! So interesting, even though I’ve never studied it. Good luck learning Finnish! I’m so happy to hear you are loving it too! I love the article, and I agree with it. However, I am not sure that you can say “Romance languages”. The correct term would be Roman languages. Thanks Mary! I love how the term Roman Languages has romantically morphed into Romance, that’s what I’ve always known them as! Kiitos Katri! 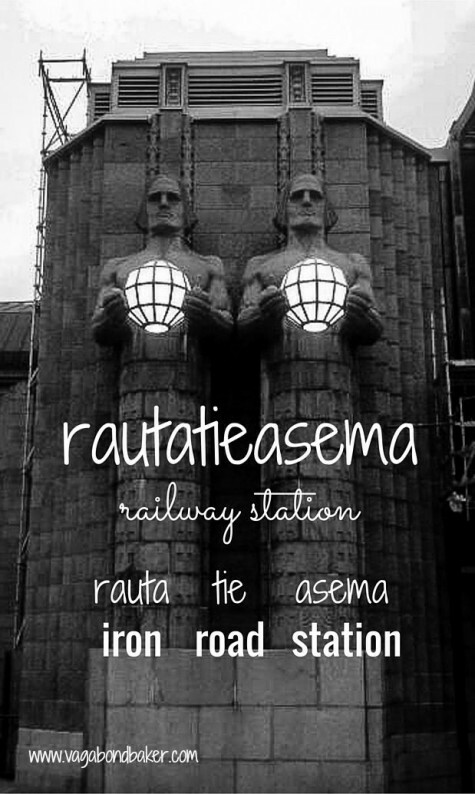 It’s such a beautiful language, I’m in Finland at the moment and loving hearing it spoken! I have a few Finnish friends who are helping me but the more help the better! Good luck with your studies too! 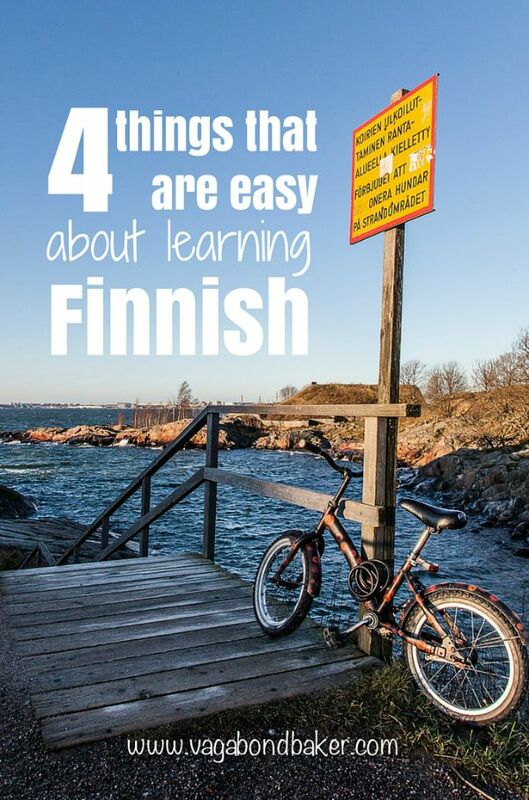 Do you find any of them particularly difficult because of being so different to Finnish? Ooh it was a pleasure to notice that you had already answered me! Thank you! About the other languages, I’ve found English ( which I previously mentioned twice-oops! )and French much more easier to learn than Swedish. English is heard every day through media and I’ve studied it at school since I was eight years old. French is a massive love of mine, and it’s also a language I’ve been studying for six years now. Swedish on the other hand is hard for me and I really don’t have much motivation to stydy it, but sence it’s our second official language, we have to study it here. Though I must say that all those tree languages have many common features, such as prepositions, articles and common vocabulary, so it’s easier to study them if you already know one or two of those languages. They sort of support each other. I wish you have a great time in Helsinki even though it’s absolutely freezing right now (yesterday when I got home from work I noticed that my eyelashes and hair had been frozen :D). Lämpimin terveisin, Katri. My lashes frozen in the first week! They haven’t frozen here on Suomenlinna today! I think I would find Swedish much easier as it’s so closer to English than French or Finnish. I learnt French at school and it’s still the language I know the most in, but not enough to hold a proper conversation! Goof luck with your studies! Finnish is my first language, but I have studied Swedish, English, German, French and Russian. And I used to be fairly OK with others but Russian. Now I live in USA, so Finnish is not an everyday thing..
You should add a few thing for the readers. Finnish language has cases, we don’t use prepositions as much as other languages. Also, consonant gradation might be hard for foreigners. We had to learn part of it at school and still some people don’t have it right. Verbs have modes and the language morphs, you have to conjugate them. Those are just a few examples. And I would not simplify the pronunciation either, there are all kinds of rules. Even we as Finns, had to learn a thing or two about the language at school, not everything was learned at home or dialects made it different. Good luck to everybody who will learn any amount of Finnish. It’s a fascinating language. Thank you so much for commenting Leena! I’m now getting stuck in with the grammar and conjugation – while I’m finding it quite hard I also gain a lot of satisfaction from conjugating verbs! I wrote a much earlier post about how I was learning it (at the time) that included getting familiarised with consonant gradation and the cases. I find I can see/remember the CG when reading/writing but it’s so much harder to spot/remember when listening and speaking! Tricky tricky! The same is true for when I learnt English as a kid, school English was very different to home english! We have so many different dialects here in UK, it’s also really interesting. What an inspirational post…you’ve outlined the language so well. I can’t say I’ll ever learn Finnish as I’m struggling with French but my great grandfather came from Finland so never say never! Merci beaucoup! Good luck with your French, my main goal at the moment is to know Finnish more than I know French (from High School), but I’m not quite there yet! (sorry, it posted it without me finishing it! )…How lovely that you have some Finnish heritage! I love the comparison to baking Rachel. I think you’re doing an amazing job learning Finnish and I totally admire your commitment to it. Btw, love the ‘table information machine’! 😀 thank you! I was trying to explain it to someone recently and used the comparison, I think it works perfectly! The literal translations often make me smile! “It´s not that, hard, it´s completely different”- Well said 🙂 Hungarian and estonian are relative languages with finnish. I don´t see any similarities with hungarian and finnish words, but I get some estonian words and get some estonian, even I have never learned it (except very often the estonian words do have a different meaning- for example finnish word “kummitus” means “ghost in finnish and in estonian it means “bride” :D). But my point was, that estonians get finnsh language very easily, because we belong to the same language group. I know estonian people, who have moved to Finland without knowing the language, but in one year they have been 100% fluent with finnish. Same phenomenon goes, for example, between english and swedish or swedish and german They are so similar languages and at school I was often so confused with the languages and similar words, when learning them same time! I bet you would be pro in swedish in a few years! I think Finnish is so beautiful and I believe it’s not as hard as everyone thinks, and I’m glad I’m learning Finnish and not Hungarian (that has even more cases doesn’t it!). When I was in Finland last December I only knew a few words (colours, numbers etc) so I was no good at reading stuff I needed (like ingredients in food in the supermarket – I’m a veggie), if I read the Swedish I found I could understand a remarkable amount of it, considering I’ve never studied it at all! It’s certainly quite similar in vocab to English, I love to see where our mongrel english language has been built from! Maybe that’s also why I love Finnish so much, it’s just so, so different! Thanks Kerry! I love learning it, it’s such a beautiful and different language!